Is it possible to update color palette in lPub osx? I'm trying to generate a pdf from some instructions I created in bricksmith on OSX. However, lPub doesn't seem to recognize some of the colors and renders them incorrectly. Things like pearl gold ends up brown or med azure ends up gray. Is there some way to update the color palette so that it matches bricksmit/ldraw where the colors render correctly? 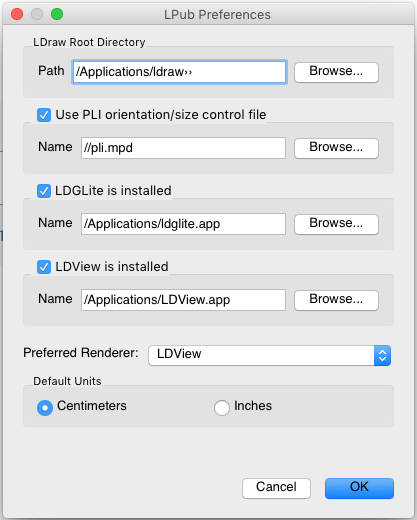 within LPub you have the option to use either LDGLite or LDView. I recently had a similar issue with colours and switched my Preferred Renderer to LDView, this resolved the issue. Thanks for the suggestion. I do use ldglite. Unfortunately, ldview does not render on my system at all.